Before I start writing and you start reading, let us bow our heads in a moment of silence for our fantasy football cohorts who drafted Le’Veon Bell in the first round this year. Though Week 11 is here and it’s time to start preparing for the playoffs, we should be grateful we are not one of those players. All I can say to those of you who did draft Bell is that I hope you were able to pick up a Nick Chubb or an Aaron Jones to ease the burden. Once more I sit to write about the Cowboys and once more I find myself focusing on Ezekiel Elliott. It really is amazing to consider that every week the opposing defense knows Elliott is the only real weapon the Cowboys have and yet he continues to put up big numbers. Last week he torched the Eagles to the tune of 19 carries for 151 yards and 1 touchdown, while adding 6 receptions for 36 yards and 1 touchdown. Having seen the Falcons defense chewed up by Nick Chubb, I expect more of the same this week. It’s also worth noting that the Browns, like the Cowboys, lack a consistent deep passing game, so there’s no reason to fear them loading the box to stop Elliott. What will really make it interesting is the development of Amari Cooper’s role in the Dallas offense. Against the Eagles, he finished with 6 receptions on 10 targets for 75 yards. While these are not huge numbers, they are significantly better than anything else Dallas has seen in the passing game in 2018. This video shows exactly why there is reason for optimism in Dallas going forward. While Dak Prescott’s ability to throw down field is still a question mark, it should be easier to complete deeper throws with Cooper running the perfect routes shown above. If this happens, Cooper is a great pick up if he was dropped in your league during his up and down time in Oakland. It also means defenses would have to drop their safeties back and Elliott would have space for the first time all season. In Week 10 against the Browns, the Falcons red-zone woes returned. As shown in this clip from the Browns Countdown, though the Falcons had little trouble moving the ball up and down the field, they could get nothing done in the red zone. On the particular sequence of plays examined in the video, it’s not a talent issue, it’s a play-calling issue. This came after a pretty good call earlier in the games, seen here at the 3:55 mark, in which the Falcons threw a screen on 3rd and Goal to Julio Jones and he was, simply, too big and strong for the Browns to keep him out of the end zone. Both Jones and Austin Hooper excelled in the passing game, each finishing with 1 touchdown, so I have to think the Falcons will focus on them when they get into the red zone this week. As I’ve been writing since Week 1, every Falcon player’s fantasy value is severely impacted by their performance in the red zone. It’s what takes Jones’ 100 yard games and makes them 25-30 point spectacles. Continue starting them, but pray you catch them on a touchdown friendly week. This is one of the more intriguing match-ups of Week 11. At this point, the Panthers look to remain the same, with Christian McCaffrey still being the only player on their roster worth starting. While they were destroyed by Pittsburgh in Week 10, McCaffrey still put up insane numbers. He had 14 carries for 77 yards and 1 touchdown, plus 5 receptions for 61 yards and 2 receiving touchdowns. Every time I watch his highlights, it never ceases to amaze me how dangerous he is in both the rushing and passing games. In many ways, he’s the ideal fantasy running back. If his team is up, he can run out the clock. If they are down, they desperately need him in the passing game. And, in the close games, he is the lifeblood of the Carolina offense. With the Panthers fighting to keep their spot in the NFC playoffs secure, he won’t be slowing down late in the season. A week after limping to only 9 points against the Vikings and looking lost on offense, the Lions looked a bit better in Week 10. Now coming into Week 11, there is some clarity on their fantasy prospects as they round out the 2018 season. Kenny Golladay was targeted 13 times against the Bears, catching 6 for 78 yards and 1 touchdown. Some of his back-shoulder receptions were perfect and showed he is capable of more than the underneath crossing routes. He is so dangerous on those shallow crossing routes, defenders will be tempted to cheat up, and once he and Stafford get the double-move throws down, look out. In the running game, LeGarrette Blount struggled once again with more rushing attempts (6) than rushing yards (4), so look for more Kerryon Johnson. Johnson finished with 14 carries for 51 yards and 1 touchdown, plus 6 receptions for 38 yards for an additional score. It’s hard to imagine Blount getting carries down the stretch as Johnson has long since surpassed him. As Johnson gets more carries and Blount’s role shrinks, Theo Riddick should emerge as a solid back up running back down the stretch. When Todd Gurley and Kareem Hunt see more rest, a guy like Riddick will be valuable on your roster. Against the Bears, Riddick posted 6 receptions for 60 yards. Those are not huge numbers by any stretch of the imagination, but remember, he only needs to break one check-down pass to go from pedestrian numbers to solid numbers. Plus 6 receptions are nothing to scoff at in a PPR league. With Le’Veon Bell out for the rest of 2018, Aaron Jones looking like he won’t see 20 carries any time soon, and the aforementioned rest time coming for Gurley and Hunt, Tennessee may hold a life-raft for affected players. At the start of the season, I genuinely thought the backfield tandem of Henry and Lewis would be the top duo in the NFL. Early in the season they could get nothing going and I saw them both dropped in all of my leagues. Now there is a waiver fight to pick both up. In a shocking upset against the Patriots in Week 10, Lewis had 20 carries and Henry scored 2 touchdowns. Though neither finished with a lot of rushing yards, they both looked far better than they did early in the season. This also shows the Titans are once more committed to running the football, so it’s a good idea to add one of them if you can. In the Titan passing game, Corey Davis looked like a player worthy of being the No. 5 pick in the 2017 Draft, finishing with 7 receptions for 125 yards and 1 touchdown. He’s shown flashes all season, but this was his most complete game thus far. He’s a guy worth watching as the Titans try to stay in the AFC South race. With Marcus Mariota adding some much needed consistency at the quarterback position, Davis may have finally turned the corner. Of all the waiver wire moves I’ve made over the past decade, I have to assume picking up Eric Ebron after Week 2 has to rank in the top 10. Perhaps even the top 5 (LeGarrette Blount in 2016 is still the best). Ebron had 3 touchdowns in Week 10, two through the air and, amazingly, one on the ground. Thus far in 2018, he has only 39 receptions, but 9 of them have been for touchdowns, meaning he’s scored on almost 25 percent of his receptions. Many of them have been like the two shown above, somehow the defense just forgets to cover him and the next thing they know, he’s in the end zone. Seriously look at the second touchdown catch, how could a defense not cover a tight end split out wide? It’s not like he ran a crossing route! He literally just ran into the end zone and turned around. Even with Jack Doyle and T.Y. Hilton returning, Andrew Luck is still finding Ebron when it counts. Inconceivable. Key Players: Saquon Barkley, Odell Beckham Jr.
Here’s my first game where I have very little to say. The Giants have two players it’s wise to keep starting in Saquon Barkley and Odell Beckham Jr. In Week 10, Barkley only gained 67 yards on the ground, but since it came on 20 carries we know he’s still going to get plenty of touches. Beckham scored 2 touchdowns, establishing himself as one of the rare receivers who can put up numbers even with inconsistent line play and the subsequent quarterback struggles. Then there’s Tampa Bay. Someday if a person asks me, “Nick, what’s an enigma?” I’ll go ahead and show them the highlights of the 2018 Tampa Bay Bucs. Week to week, it’s not clear who will play quarterback and who they will be throwing to. Last week I wrote about Adam Humphries and O.J. Howard since both were coming off 2 touchdown games in Week 9. Naturally, they combined for 3 receptions. Instead Chris Godwin shined with 7 receptions for 103 yards and we had a rare Jacquizz Rodgers sighting as he exploded for 8 receptions for 102 yards. The Bucs gained 509 yards on offense, but somehow finished with more turnovers (4) than points (3). Like I said, enigma. Now, ironically enough, we come to my second game with little to say. DeAndre Hopkins remains an absolute beast and thus he remains where he has been since 2014: at the top of the fantasy receiver hierarchy. I’m less certain about the rest of the Texans. We’ll need to see what Bill O’Brien cooked up for Demaryius Thomas during their bye week. In theory, he should fit right into Will Fuller’s shoes. Theory, however, is just theory until there are tangible results. Keke Coutee will be a game time decision, so there’s a lot of risk playing him. As for the Texan running game, it hasn’t produced much is 2018. D’Onta Foreman was activated off the PUP list and very well could add much needed power to their running game in Week 12 as he will not be ready for Week 11. The Redskins also provide more questions than answers. Adrian Peterson’s 19 carry, 68 yard Week 10 was better than Week 9, though it was still not, of course, a big fantasy game by any stretch of the imagination. Maurice Harris’ 5 receptions for 52 yards in halved his Week 9 break-out game, so he’s too much of a question mark. Peterson remains a good flex option and Harris is a decent back up in deeper PPR leagues. Before delving into my coverage, let me say that anyone out of the Pittsburgh receiving corp looks like a solid play. But since I made Le’Veon Bell a focus on my introduction, I’d like to discuss James Conner in this section. Against the Panthers he posted a mere 65 yards on 13 carries with 1 touchdown, which was understandable since the game was over by halftime. 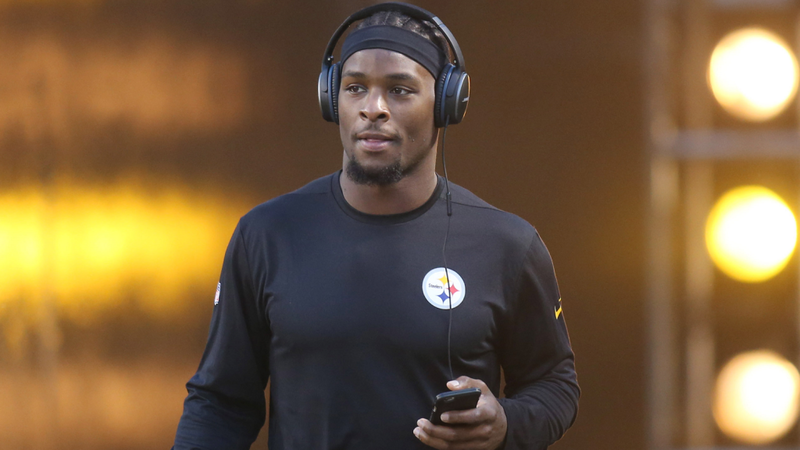 From his first game of the season, it became clear Conner was a special running back who would make Bell’s holdout inconsequential. All season Conner has been a revelation for the Steelers. I’ll say the same thing for Conner that I said about Christian McCaffrey; he is everything you want in a fantasy football running back. He’s deadly from the I and the shotgun. He can grind you down in the running game and kill you in the passing game. After Week 5, I swung a trade for Conner in one of my leagues banking on my opponent’s faith in Bell’s return. Needless to say, I think it’s clear who won that part of the bargain. I assume we’ll see Bell in a new city for 2019 as Conner has firmly established himself as the next man up for a team with a storied tradition in their backfield. Leonard Fournette finally played in Week 10. He’s already had so many injuries in his two seasons in the NFL that I’m not sure how long this will last. I would, however, suggest starting him in Week 11. The Steelers’ pass rush looks like the pass rush of old and the Jaguars need Fournette to keep the defense honest. In Week 10, Fournette had 24 carries for 53 yards and 1 touchdown, while adding a receiving touchdown and 5 receptions for 56 yards. 53 yards on the ground may not look pretty, but the more important statistic is the 24 carries. This shows the Jaguars believe he’s healthy. As they struggled so mightily with him out, they have no choice but to ramp up his touches down the stretch. Here comes my third game where I have little to say. For the Bengals, A.J. Green will be out, Joe Mixon will play despite an injury, and it’s hard to trust Tyler Boyd as the No. 1 option. They looked atrocious against the Saints until garbage time when the Saints had already moved on to Week 11. As for the Ravens, Joe Flacco is out and it’s hard to know what to expect from a Lamar Jackson-led offense. My gut tells me his speed is going to eviscerate the molasses-level slow Bengals defense, my brain is cautious of any rookie quarterback getting their first start. It’s a tough matchup to dissect. I would simply advise you to avoid starting any Bengal or Raven players if it’s possible. And, finally, my fourth game with little to say. Play David Johnson, he’s putting up better numbers of late and the Raiders defense is pretty awful. The Raiders offense may throw a sleeper out there now and again, on the whole, however, they have been shockingly inconsistent. It’s best to avoid any of their players. Now that Demaryius Thomas has relocated to Houston, someone needs to step up in the Bronco receiving corp to provide Emmanuel Sanders will some breathing room. The likeliest player to rise to the occasion would seem to be Courtland Sutton. He just missed a beautiful touchdown reception against the Texans in Week 9, showing flashes of why the Broncos drafted him in the second round of the 2018 Draft. Heading into the draft, plenty of talking heads felt Sutton was the best receiver in the draft. If you need a receiver with upside heading into the fantasy playoffs, there are few options better than Sutton. Just watch his college highlights and imagine if even a fraction of his talent can translate to this season. Combine that with increased opportunity and you could have a legit No. 2 fantasy receiver down the stretch. In the absence of Thomas, tight end Jeff Heuerman provided more than flashes against the Texans, he provided results. Heuerman ended the day with 10 receptions for 83 yards and 1 touchdown. The Denver running game has been solid all season, providing plenty of chances for Heuerman going forward. This was his first big game of the season, so he’s a guy to watch for now. The Chargers have one of their better offenses of the Philip Rivers Era in 2018. Take a second and remember the teams he came up with and let the gravity of that statement sink in. Melvin Gordon had 18 carries for 93 yards and 5 receptions for 72 yards and 1 touchdown in Week 10. He’s been so much better than anyone could have imagined when he was drafted. Not as a runner, because everyone knew what he could do after his years at Wisconsin. No, it’s been his skills in the passing game that have made him a truly miraculous fantasy football option. Barring an injury, he’ll likely finish with over 2,000 total yards in 2018. In the Chargers passing game, Keenan Allen remains Rivers’ best non-Antonio Gates option in his career. Once more he’s not getting a lot of touchdowns, but Rivers looks for him when he needs a first down. This means Allen remains a top option in PPR leagues. I’m not sure what to make of the Philadelphia offense. At times it’s looked as unstoppable as it was in 2017 and at times it’s looked stagnant. The running back situation is constantly in flux, with rumors putting Josh Adams at the top of the hierarchy entering Week 11. Looking over his 2017 college highlights, it’s not hard to imagine why. His ability to run out of the shotgun make him an ideal back for the Philly RPO attack. And at 6-foot-2 and 225 pounds, he provides more power than the other backs on their roster. Still, Philly rode a rotation of running backs all the way to a Super Bowl upset last season, so it’s hard to say, “this is the guy” with any Philly back. This will be a high scoring game, so if there was ever a time for Philly to ride one power back, this is that time. In the passing game, Zach Ertz posted a ridiculous game in Week 10 with 14 receptions for 145 yards and 2 touchdowns. Look for another big game from him, especially if Adams does indeed carry the running game. While the Philly offense has talent, it does not have the same level of talent as New Orleans. They would be wise to play keep away and let Adams and Ertz run down the clock with clock-draining first downs. Any coach who wants to teach their football team about how to run an offense, should just show the game film from last week’s Saints at Bengals match-up. Look, the Cincy defense is not great by any means, but my word, what a game from the Saints. Mark Ingram killed to Bengals on the ground with 13 carries for 104 yards, along with 3 receptions for 58 yards and 1 touchdown. Michael Thomas ripped them apart through the air with 8 receptions for 70 yards and 2 touchdowns. Not to be outdone, Alvin Kamara beat Cincy on the ground with 12 carries for 56 yards and 2 touchdowns, along with 4 receptions for 46 yards. Even with depth concerns in the wide receiving corp, and the untimely Dez Bryant injury, the Saints are rolling on offense right now. It doesn’t look like anything but rest is going to slow them down. This very well could be the most important fantasy football matchup of Week 11. After relying on the arm of Kirk Cousins through most of the early season, the Minnesota running game has finally come on over the past few weeks. What remains to be seen is who will pick up the carries. In Week 9, Dalvin Cook and Latavius Murray each had 10 carries. Cook used his to gain 89 yards, while Murray gained on 31, but he had 2 touchdowns. With the temperature in Chicago hovering in the mid-30’s tomorrow, not to mention a windchill in the high 20’s, we can expect the Vikings to run the ball tomorrow. Since they’ll also being coming off a bye week, we can expect to get our best look at what to expect from the Viking running game down the stretch. So, while I don’t recommend starting either back if you can avoid it, take a look at how the carries are distributed and what each back does with his share of the carries. If either back, or even both backs, start putting up numbers, they would be invaluable down the stretch. Outside of intrigue in the running game, Minnesota’s Week 9 clash with the Lions also provided an answer to a burning question: what happens when Adam Thielen doesn’t have 100 receiving yards? The answer? He still finds a way to score a touchdown. This makes 6 games in a row where he’s scored a touchdown and means he’s scored in 7 of the Vikings 9 games in 2018. At the start of the 2018 season, my best friend Paul and I made fun of the Bears trading for Khalil Mack. What a waste of money, we jested, the Bears are the fourth best team in the NFC North and won’t compete any time soon. I’d never speak for him, but can assure you I feel plenty stupid for having said it now that it’s Week 11 and the Bears are in first place. I admit, I did not think Mitchell Trubisky was ready yet. While he has been inconsistent at times, he’s exceeded my highest expectations. New coach Matt Nagy also took far less time than I thought implementing Andy Reid’s offense. Thus far the Bears have excelled spreading the ball around and capitalizing on misdirection to get their players the ball in space. What remains to be seen is how this will continue to affect fantasy football. With they establish a core group that puts up numbers (like Kelce, Hunt, and Hill in KC) or will they rely on different players each week? Last week it was Allen Robinson and Anthony Miller who put up the big numbers. Let’s see if it’s them again this week or if the other skill position players step up. As with the running back situation in Minnesota, the implications of this question are going to have a huge impact on the rest of the fantasy football season. There’s no reason to draw this out. Both teams are absolutely ridiculous on offense and have defenses that have struggled against the run this season. This should be a clinic on how offenses should be run. If you have players on either side, start them. Both teams could finish with over 40 points.